I think it has been in place for some time now but pray my poor observation skills, I observed it yesterday only. In cricket matches, two ad spots which have perhaps the highest visibility are the ones just behind the starting point of a fast bowler's run up. Shoaib Akhtar used to start from those banners on the ground. up and camera zoomed on the pitch, the advertisement went out of sight. Or in case of spinners, it hardly was visible. One could only see it behind the batsman but it was facing the other way. Now, yesterday I observed the banner behind the batsman was facing the camera or in the same direction as batsman. So now when the camera zooms on the pitch, you can see the advertisement or in fact read the name of the advertiser as it ought to be read. On the face of it - may be not because generally it is a popular brand with a known logo or name. You know that it is Airtel or KFC even if you see the name reversed. But may be at some psychological level, it makes an impact as legible words are in your face. In any case, it makes sense to have the banner in the direction where it is going to get the maximum footage. No one had thought about it for many years. Now someone, somewhere has shown some creativity and challenged the status quo! 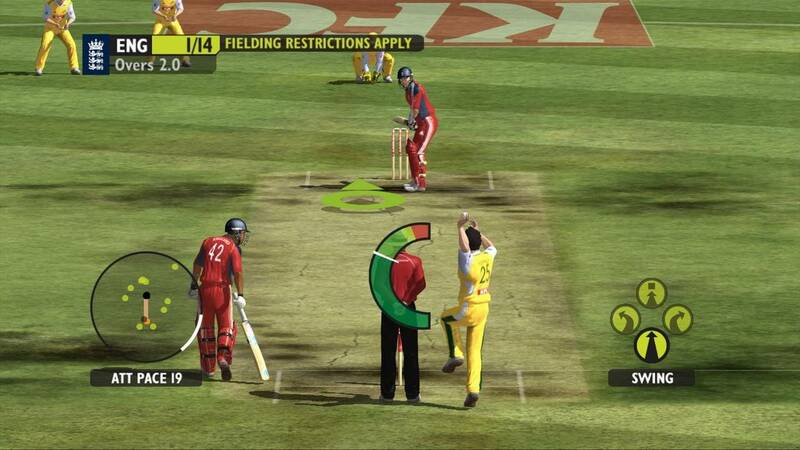 This one is from a game where when the spinner is bowling, the logo in the background is reverse, thus making less impact. Now-a-days it faces the camera. I look at it the other way .. When bowler is moving from the run up I look at the run up and the back ground but when the bowler bowls the bowl , I am interested only in how the batsman plays the delivery. So it might makes more sense to keep the status quo and do the ulta pulta . Nice observation , I need to watch the match and check how it really works and what happens when spinners are operating , Can I still see the background Image ?